The best vehicle interior upholstery cleaner on the market! The Bissell Little Green Pro Commercial Spot Cleaner was designed specifically to allow you to clean the tight, niche, and hard to reach areas of your carpet and upholstery. The Bissell Little Green Pro Commercial Spot Cleaner packs the same superior suction that you have come to expect from the name Bissell! The powerful brushes on the Bissell Little Green Pro Commercial Spot Cleaner will make quick work of any dirt or stains that plague your car’s interior. You also won’t have to make nearly as many trips to refill the Bissell Little Green Pro Commercial Spot Cleaner thanks to its large capacity tanks! Carpet and upholstery interiors are the most common and practical types of interior and for good reason! These materials have many upsides that make your car’s interior much more pleasant when compared to other materials. It doesn’t hold onto heat, it does not get extremely cold to the touch, and it makes for a plush and comfortable feel. However, it does have one major downfall. Carpet and upholstery are extraordinarily difficult to clean! The fibers will quickly absorb liquids and will trap dirt and other contaminants almost immediately. And once these contaminants have been trapped, it is nearly impossible to get them out completely. That is, unless, you have a Bissell Little Green Pro Commercial Spot Cleaner! The main thing that you need to properly clean carpet and upholstery is plenty of suction! Even if you scrub until you are blue in the face, without any suction, you are just moving the dirt around or pushing it even deeper into the fibers! 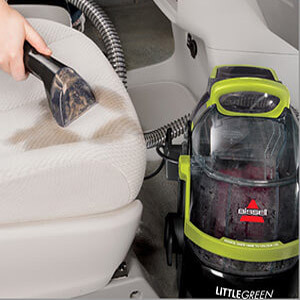 Luckily, the Bissell Little Green Pro Commercial Spot Cleaner has more than enough suction to tackle any amount of dirt that your interior has managed to collect. The name Bissell is already quite well known for their top-of-the-line vacuums, so you can trust that any machine made by Bissell is going to have the suction power you need to get the job down. Suction alone isn’t enough though. While suction does a great job of removing loose dirt and debris, it will not be able to pull out the particles that are trapped deep in the fibers of your carpet and upholstery. This is where the powerful brush system on the Bissell Little Green Pro Commercial Spot Cleaner comes in handy! This brush system is able to penetrate deep into the fibers of your carpet and upholstery, breaking up and separating all the contaminants that are resting there. Once they are broken up and loosened, the powerful suction will do the rest! When you are cleaning your carpet and upholstery with a vacuum extractor, there is nothing more annoying than having to stop completely just to go empty and refill the water tank! This is precisely why the Bissell Little Green Pro Commercial Spot Cleaner was designed to have a much larger tank capacity that your average carpet cleaner! This large tank can hold almost a gallon of water or cleaning solution at a time!